Graham Sutherland was born in Streatham in South London in 1903. He abandoned a railway engineering apprenticeship to study at Goldsmiths' School of Art between 1920 and 1925 where he specialised in engraving and etching. From the start of his career he was influenced by the English Romantic tradition: William Blake, Samuel Palmer, J.M.W. Turner, Paul Nash and Henry Moore. His first two exhibitions of drawings and engravings were at the XXI Gallery, London in 1925 and then in 1928. Between 1926 and 1933 he was a member of the Royal Society of Painter-Etchers and Engravers, and taught at the Chelsea School of Art from 1926. He exhibited with the London Group from 1932, and participated in the International Surrealist Exhibition in London in 1936. His first one-man exhibition of oil paintings, rather than drawings and engravings, was at the Paul Rosenberg and Helft Gallery in 1938. He was an Official War Artist between 1941 and 1944 and after the war became an increasingly international artist, exhibiting in New York and working in France. He is particularly remembered for his religious paintings and tapestries in cathedrals and churches in Britain, having converted to Catholicism, as well as his portraits of well-know individuals such as Somerset Maugham and Winston Churchill. He was awarded the Order of Merit in 1960, and had significant retrospectives at the Tate Gallery in 1953 and the Dulwich Picture Gallery in 2005. 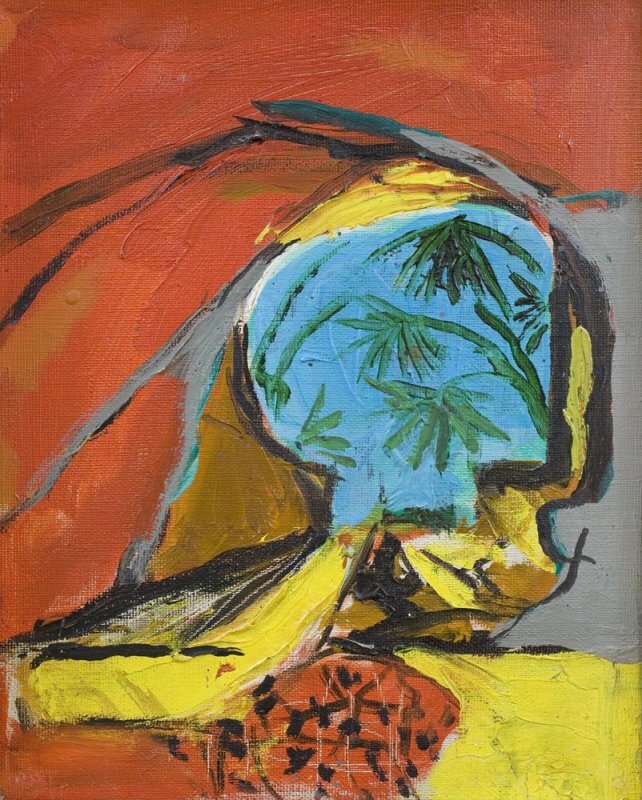 Painting in 1961, 'Cave Entrance' is a re-visiting of a motif which long fascinated Sutherland throughout his career, that of openings, entrances, passages and lanes. These junctures were of great artistic interest to Sutherland, sites with the potential for movement and transition, for unusual view points that could be suggestive, evocative and mysterious. An earlier, highly significant painting exploring this motif was Sutherland's 1939 'Entrance to a Lane', now in the Tate Collection. Around the same time as 'Cave Entrance', Sutherland painted the aptly titled 'Dark Entrance' (1959) and a year earlier 'A Path in Woods' (1958; Norfolk Museums Service collection), a work of similar size and composition to 'Cave Entrance'. Most of these entrances are of Pembrokeshire, but 'Cave Entrance' is palpably from Sutherland's beloved South of France, famed for its prehistoric caves with cave paintings.